As you can see from our crossbow reviews Barnett is one of the best available on the market. However, we are not done yet, the following crossbow is great for handling, firing problems, firing speed, grip related concerns, weight, and packed with power. 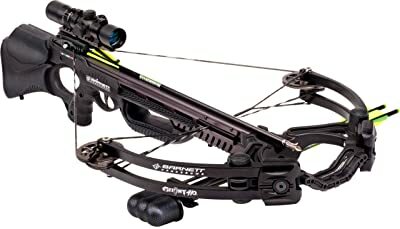 Read on and find out what this Barnett Ghost 410 Crossbow Review can do for you! The Barnett Crossbow Ghost 410 is not only beautiful in design it helps to solve some common problems found when using these devices. The first one it helps with is dry firing that is a common problem for crossbows. It has an anti-dry fire safety that helps to prevent damage to the crossbow in the case of dry firing. It is made of a lightweight material carbon CRT and a sturdy crossbow. Because of this composite laminate, it also solves the vibration problem found on certain other models. The limb of the devices designed to maximize firing speed. This, in turn, helps the limbs to move 1.5% faster – contributing 410 feet per second. Gripping the crossbow is a breeze with the designed, comfortable grip that is moisture resistant as well and great when shooting in cold weather keeping your palms warm. With your fingers placed on the grip, it is out of the way of the flight rail and great for a novice shooter. This helps to make sure you do not injure yourself. It also features a shoulder plate and may seem boring, but helps you to aim. When it comes to accuracy, the Ghost 410 is a winner as the overall weights distributed and gives you a perfect shot. You receive a scope included in the package and nearly sighted in right out of the box. The shooting speed of the unit is super fast and yields kinetic energy at 149 ft-lbs and one of the fastest in the range. The crossbow comes integrated with a foot stirrup and comes fully mounted with the scope on the stock. Assembling the device is a breeze and for some consumers, it only takes up to 4-minutes. All the needed hardware and tools are included in the package and you only need to secure the riser to the stock. The quiver mounts to the bottom by using two screws and included in the package. The device is great to carry around with you and only weighs 8 lbs with a short axle length and great for maneuvering around. Where sounds concerned, it is as loud as most other crossbows on the market. However, it does shoot fast and the faster it shoots you can expect it to become louder. A bonus with this package is that you receive a rope-cocking device included and the great thing is that you can either shorten or lengthen the string. When it comes to the Ghost 410 Reviews, there are not many complaints. Clients are pleased with this crossbow rating it with 4.4 stars for being easy to use, superb power, and accuracy. They found the instruction manual easy to understand and the scope useless. This crossbow is worth its price with everything that you receive included. It has great speed, comfortable to use, ease of use, great safety, and very accurate. If you want the best on the market this is the one to own. We hope that our Barnett Ghost 410 Crossbow Review helps you to make that decision in getting yourself one – you will not be sorry!